What’s the longest ever run in fancy dress? The official answer according to the Guinness World Records organisation is… well…uh… no one cares. To start this blog I must admit to having mixed opinions about World Records, on one hand they can represent an amazing achievement such as a fantastic feat of strength or endurance with people pushing the human body to new limits (i.e. athletic feats). Obviously this includes all those Ultra Runners in our community who do have various world records to their names! However, on the other hand they can represent fame hungry attention seekers whose claim to fame is thinking up a ridiculous new category of world record that no-one has thought of before or doing something a bit rubbish but marginally quicker than the previous person who thought up the same rubbish idea. Of course there is a level of acceptability somewhere in between the above examples. When the idea of doing our charity runs in fancy dress with Stouty came about it got me thinking out of curiosity what the longest ever run someone has completed in fancy dress and whether we could be fame hungry attention seeking individuals it was even possible to set a world record with by running the Thames Path 100 mile run in fancy dress in March? If this did come off, it would mean some added promotion for our charity fund raising efforts. 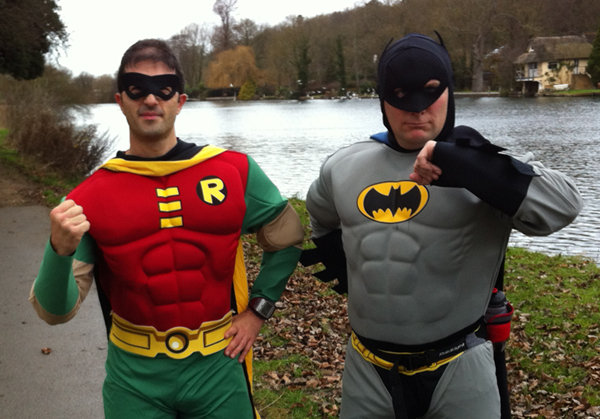 “Thank you for sending us the details of your recent record attempt for ‘Longest Run In Fancy Dress’. We are afraid to say that we are unable to accept this as a Guinness World Record. Well perhaps not all is lost… because some web research has revealed a website called alternative world records http://www.alternativerecords.co.uk/where you can submit your record and if verified will be featured in our book which is available to purchase.Yes, to have a record ranked alongside “The longest gum wrapper chain” or “The longest strawberry cake” would be an amazing achievement! Well, perhaps not then. So you thought you were reading an interesting blog post about world records and it actually turned out to be a stealth charity plea. Apologies for that, but we are running for a good cause and any donations would be very welcome, thank you. I always hungry to see latest designs in market, it is true that there are plenty of stores however there are also big competition of prices and quality.